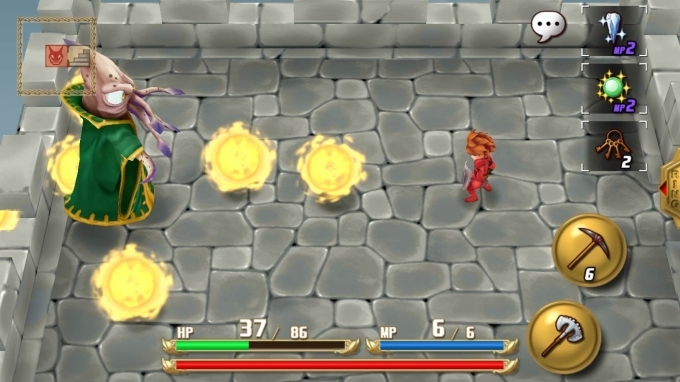 The Mana series is the closest that Square Enix comes to a B-grade franchise. That’s not to say the games released under its name are bad (I’m one of the very few that genuinely love Children of Mana on the Nintendo DS), but with the exception of Secret of Mana, this series has never really produced what could be called a truly classic title. Adventures of Mana comes so very close. 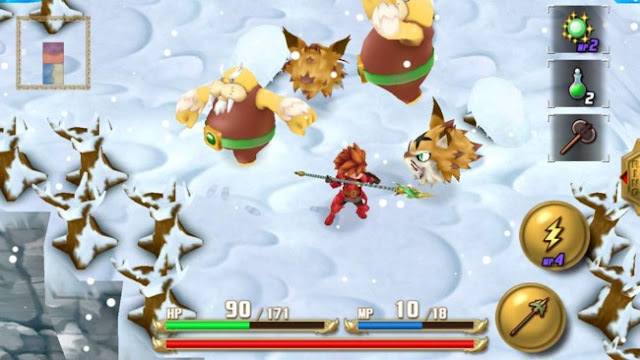 A remake of, of all things, a Game Boy title, Adventures of Mana is a simple action JRPG owing to that heritage, but it’s also immensely playable, and one of the most enjoyable examples of that particular genre on the mobile platform. Most importantly of all, it’s a game that hasn’t been laboured with free-to-play mechanics. 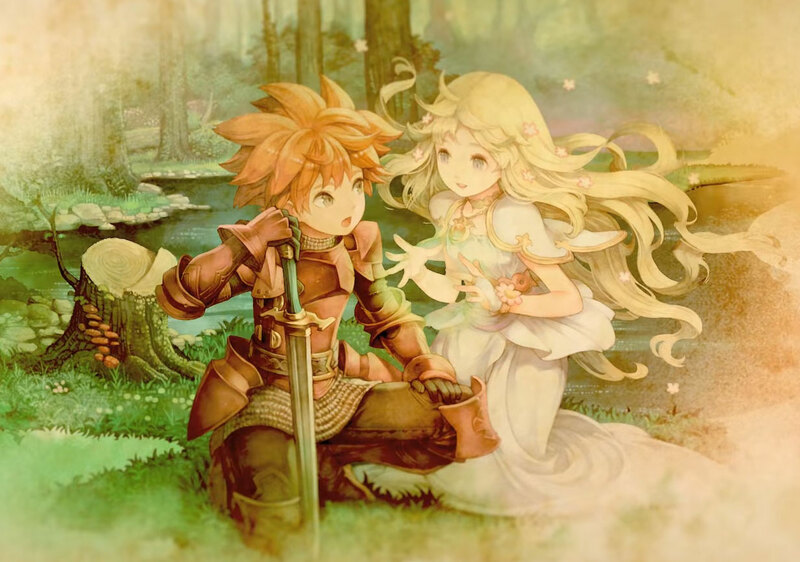 Where other JRPGs on mobile have forced in premium currencies for weapon drops, level structures with timers, or similar, and thus hurt their narrative cohesiveness, Adventures of Mana has the confidence to be a premium-priced game, and gets all the respect in the world from me for that. The game does nothing special or unique with its narrative, as you might expect for a game with such an old heritage. Players take on the role of a hero that is forced to fight it out, day after day, in a gladiatorial arena. One day he sees an opportunity to escape, and does so, before setting out on an adventure that has him taking on dark lords, protecting beautiful maidens, and hacking and slashing his way through endless hordes of Mana’s classic enemies. Of course, that kind of narrative is not necessarily enough to keep modern players hooked, but it has a nostalgia appeal that will be appreciated by genre veterans. Further, the narrative is backed by a nice flow in the environments that players will explore. A little like early Legend of Zelda games, in Adventures of Mana the world is split up into single-screen squares, and each of these will spawn certain enemies each time they’re entered. Because the world is nicely small in size, the visual variety is kept strong as you’re moving through the overworld, but it is constructed in such a way that forests merge into swamps or mountains in a enjoyable, believable way. The second area where Adventures of Mana borrows heavily from the Zelda games is in those dungeons. Just like Nintendo’s classic series, dungeons are also split up into single screen “squares,” that change as players move their hero from one “room” to the next, and these squares will host a series of enemies to defeat and, often, a puzzle. Overcoming these puzzles and collecting the treasure from within is not quite as involved as what we see in the Zelda games, but it’s still enough to be mentally taxing at points, and there’s inevitably a nice reward at the end of them to feel like the work has been hard earned. The JRPG elements, meanwhile, are really quite light. After each experience level, your hero gets to pick from four different classes – Warrior, Monk, Mage or Sage. The choice determines how the statistics level up. It’s about the extent of the character customisation system, and it’s a little disappointing how little variety is in there, though to the developer’s credit, the balancing is excellent, and the challenge always seemed to suit whatever my character’s level was at the time. While you’ll only ever be in control of the one character at a time, he will periodically be joined on his quest by allies that join him for brief periods of time. These alliances are typically to take on a single challenge or dungeon. Unfortunately this is the weakest part of the game’s mechanics; the help is all but useless, and will simply run around for a period of time before arbitrarily throwing down an ability or magic spell to remind you that they’re there. Luckily there’s not a moment where you’ll need to rely on these guys. They also could have been used to help give players advice when they got stuck, but unfortunately they don’t say much of worth. So, if the game is a fairly generic action JRPG with basic levelling and terrible AI, why am I so fond towards it? In part it is a sense of the retro. I remember playing the original version of this game, Final Fantasy Adventure, all those years ago on my Game Boy, huddled under the bed sheets with a touch in the hope that I could get some play done before my parents caught me. Which, as an aside, reminds me: where the heck are the Final Fantasy Legends Game Boy games on the Virtual Console, Square Enix? 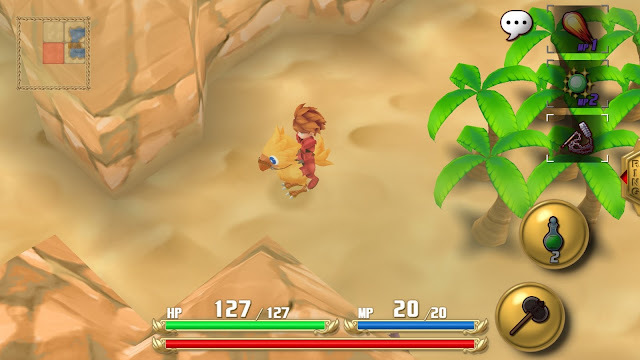 While this game has a fresh coat of paint, it still plays like a classic Game Boy JRPG, and all the little nods to Square Enix’s heritage – chocobos and the like – also help to scratch the nostalgia itch. The other thing I love about Adventures of Mana is that it is presented so nicely. There’s a real vibrancy to the environments, the soundtrack is spot-on, and the enemies – which include many faces such as rabites that Mana fans will recognise instantly – have a lot of personality and charm to them. The game also offers the best virtual control stick and button layout I’ve ever come across – for an action game, to be able to play through and not once have my character do something crazy because of a wayward virtual button press, is impressive stuff. I hope this game comes to Apple TV or console down the track. While it’s not an essential game by any means it’s so overwhelmingly pleasant that I’d love to be able to kick back with it on the big screen. It’s good to see Square Enix keeping the Mana series alive, even if it is with relatively low profile releases such as this one.